From the two-screen habit to the twitter bomb, televisionification to crowd-sourced plots, the way we consume and make TV is changing… The idiot box used to have our undivided attention. Now it is an increasingly fragmented experience. According to MediaCom, nearly 75% of us multi-task while watching TV: 42% are online, 29% are talking on mobile devices, and 26% are sending IM or text messages. This “two screen habit” has made television an event, where hundreds of thousands interact and comment on content, in real time. Last year, TV Genius reported that a particularly dramatic X Factor weekend stimulated 257 tweets per minute; four tweets for every second the show was transmitted. From on-air hashtags to Twitter trends, the switch to ‘participation TV’ is clear. But the twittering classes are not only affecting the way we consume television, but also changing the way it is made. Some broadcasters are now responding to real time social engagement to adapt live programmes. For the past four years, Twitter executives have been working with channels like MTV to focus live shows in response to what’s trending. But what about pre-recorded content? “Many writers, producers and directors now go so far as to include a ‘Twitter bomb’ in the narrative of their programmes,” says James Kirkham from creative agency Holler. “They broadcast intentionally polemic or incendiary content which will cause an explosive effect”. Mark Sorrell, Head of Games at Screenpop, suggests there is more to come in the form of interactive TV, where the show reacts to viewers input individually. This would represent the “televisionification” of games, with audiences transformed into players and their actions reflected back to alter their experience of the show. However, Sorrell acknowledges “these kind of shows won’t necessarily make for good television”. He comments that TV is linear and passive. Games are largely neither. Plot lines, weekly scripts, music choices and character development were all influenced by internet-based democracy. Once a plot was selected, professional writers turned it into a full script in a process dubbed “directed collaboration.” Television has always responded to audience tastes and opinion, but can viewers make engaging TV? Is the art and skill of storytelling being forgotten? For many creatives, who wish the ‘dark art’ of programme-making to remain a closed shop, this will be hugely threatening. 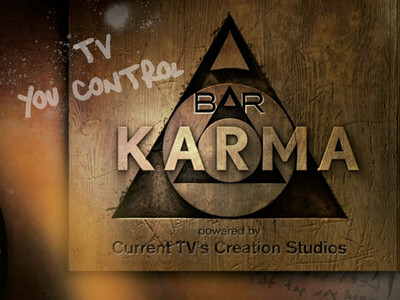 But the interest in Bar Karma is undeniable: over 14 million have visited the website to date, in comparison to Current’s estimated 23,000 nightly viewers. So it seems the democratisation of television is under way. But will extended audience participation create truly engaging, sustained and innovative narrative experiences? The jury is out. But, as in most cases, creative quality will be the judge. Next: Next post: Cash or Creativity: the Future of British Film?